Here we are in November and I am ready to provide a huge update (remember I have not posted since February). Peyton started walking in March, right before her second birthday!!!! We were ecstatic and so thankful to Peyton’t team of therapists that helped get her there. Back in March, Peyton had about 10-14 hours of therapy per week of PT, OT, Child Development, and Speech. We had been driving to LA to the NAPA Center(Neurological and Physical Abilitation Center) once or twice a week for 3 hours of therapy/day and we finally felt like Peyton was ready to handle an intensive therapy session, which is 3 weeks of therapy for 3 hours a day, focusing on Physical and Speech Therapy. I have to admit I was not quite sure we were ready for the drive everyday and just the overall commitement, especially thinking about Chad (our 3 year old son (Now 4, as of October). I am so thankful to our family and friends for their love and support and giving us that extra push that we needed to just do it! And thank you to my Mom who was there for Chad…it definitely takes a village. The therapists at the NAPA center are amazing and people travel from all over the world, with many different syndromes and conditions, to attend the intensive therapy sessions. Our first 3 weeks were amazing, I did not want it to end, so we signed up for a follow-up week in April (I did feel a little bit addicted). Peyton did so well and improved so much that we have decided to take a break from once or twice a week trips to LA and continue with once a quarter intensive 3-week sessions. We had a follow-up 3-week session in August and it was awesome. We will do it again in December. Whoo-hoo! In April, we went to see Dr. Miller, Peyton’s amazing Endocrinologist in Florida. We are so blessed to have her in our lives and as the lead on Peyton’s team. 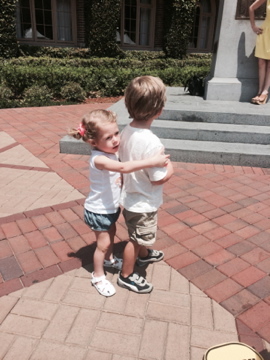 Brent and I went alone with Peyton for a very quick, 2-day trip to Florida. We were excited to see Dr. Miller and for her to see Peyton. The night before I had a little meltdown, it hit me unexpectedly, as I realized that I was afraid of what we might hear at Peyton’s appointment. So many times before I set myself up for a successful Doctor appointment and then I am blindsided by the news that they give us. The week prior, we had Peyton’s x-ray of her spine and hips, tracking the curve in her spine and any hip dysplasia, along with her quarterly bloodwork, and I was just nervous for the results. As always, Brent, my amazing husband, reminded me that this is why we see Dr. Miller, if there is something wrong, she has the answers and the experience, and will tell us what we need to do. She sees hundreds of patients a year with PWS, she does a lot of the research, she is the expert, this is why we fly to see her every year and we are never dissappointed. I am happy to report that Peyton’s appointment went extremely well and we went home with a prescription for orthotics to help with Peyton’s stability. 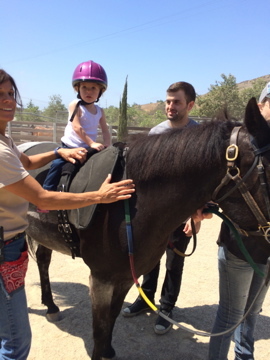 In May, Peyton started Hippotherapy (Horseback riding therapy) and she absolutely loves it. She loves her horse, Bliss, and she is gaining more and more confidence. She loves to kiss and hug him and feed him apples and carrots at the end of therapy. Peyton works with a speech therapist while she rides Bliss. The Center where Peyton rides had their annual fundraiser and they asked Peyton to be one of the riders. They had 1,000 people at the event. Peyton rode her horse, waiving and blowing kisses to the crowd. It was truly magical to see her out there. In July, Peyton received her orthotics. I was so excited to pick them up. We ordered the ones with little pastel flowers on them and pink straps. I have never seen a little girl rock orthotics like our Peyton. I could see the confidence in her the minute she put them on, they help to increase her balance and stability. In August, Peyton started 4 hours/week of Behavioral Therapy to help with some of the behavioral issues that can come along with PWS. We are finding this therapy extremely helpful. 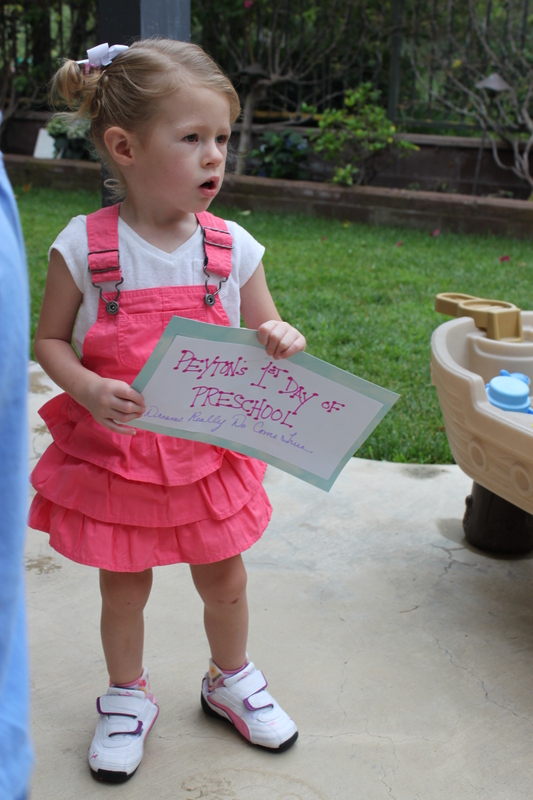 In September, Peyton started Preschool, TYPICAL PRESCHOOL!!!! This was huge for us. Peyton and I would take Chad to school and she started saying, “I want to stay”, and I realized that we should look into that. Here is my 2 year old giving me the advice. Her preschool is amazing, they have small classes with two teachers, which seemed like the perfect environment for Peyton. I looked at a special needs school that was wonderful, but for Peyton, I did not feel like it was the right fit. Peyton is progressing so well and we do not want to limit her. She is so capable and we will do all that we can to help her achieve. Achieving doesn’t mean typical or special needs school, achieving means that she is being challenged, not to a point of full frustration, but challenged to where she is thriving and confident in herself and her abilities. We will not limit her and we refuse to make assumptions for her just because she has PWS. We are committed to helping Peyton to be the best that she can be. She is already perfect in our eyes.